It is a sport that most people like to play and the most fun because the ball is a sport that is easy to play and fun. Can play with many friends. It is a good idea to have a good team in order to be able to win against the opposing team. Volleyball helps us to have a healthy body. A sport where athletes use their full body to run, jump like an arm. It is a competitive sport between two teams of six players, each with a free agent divided by the net. Race to score a ball in the opponent's territory to hit a volleyball ball into the enemy territory. Volleyball was born in 1896 by William G. Morgan, Director of Physical Education at the Y.M.C.A. Association of Holocaust, Massachusetts. United States of America It happened only one year before the 1st Olympiad in Athens that he wanted to have sports in the winter instead of outdoor sports for exercise, recreation, snow. He has come up with the idea to bring style and methods. Play of tennis adapted to play. So use a tennis net, which between the gymnasium pole. 6 feet 6 inches high and use the rubber in the basketball ball to tighten. Use your arms and arms to cross the net. But the rubber in the basketball is too light. The ball moves slowly and the direction is unstable. Then switch to the basketball. But basketball is big. Heavy and too hard The player's hand is injured. In 1896, there was a Physical Education Leadership Seminar at Springfield College. William G. Morgan demonstrates how to play the meeting after the meeting. Professor Alfred T. Helstead suggests Morgan switched from Mintonette to "Volleyball", arguing that it was a way of surfing the ball to float across the net. The player tries not to drop the ball. Volleyball has spread into Thailand from where it is not clear. Some Thai people started playing volleyball and competing in World War II. In 1934, the Department of Physical Education published the rules published by Noppakan. Pong Suwan, who organized the annual sport and packed women's volleyball into the tournament for the first time with the rules of playing the system 9 people, and since then, volleyball was developed all along. A meeting was held to establish the association. Until the establishment of the Amateur Volleyball Association of Thailand on 28 July 2502 and change the system of competition to 6 people and later put into the secondary school. Beginning in 1978, the high school curriculum in 1981. The Thailand Volleyball Association is a national sports organization. For Thai volleyball manager The official volleyball tournament. Both indoor volleyball and beach volleyball. And support the national volleyball team of Thailand. Volleyball Association of Thailand Members of the Asian Volleyball Confederation And the International Volleyball Federation. As a result, Thailand's volleyball is recognized both at the continental and world levels. Headquartered at Sports Authority of Thailand, Hua Mak, Bangkok. Asian Volleyball Confederation (AVC), also known as AVC, is a continental sports organization. Volleyball Management in Asia and the Oceania Region Both indoor volleyball and beach volleyball. Asian Volleyball Federation is a member of the International Volleyball Federation. Headquartered in Bangkok, Thailand. A setter or setter usually puts the ball in the second ball by setting the ball to the offense to score. The set must be active, agile, tactful, tactful to choose the offense to score. Middle blocker / Middle hitter is a fast-paced, often near-set player. As well as having a good blog. It also needs to be able to block the side of the field as well. Each team will have 2 players in this position. An external hitter / Left side hitter is sometimes referred to as a hitting head from the left antenna. It is always the most consistent spat of the team and usually get the most out of the set. I do not get the first point. Set up a high ball set. Finally, set the ball to this position. Each team will have 2 players in this position. Opposite hitter / Right side hitter is the front line to protect the offensive side of the opponent. Right antenna area By blocking the left side of the opponent. And also as a backup set. Libero is a player who specializes in special games and does not need to be tall. It is the best of the team. And will have to wear a different set of players in the team. Libero does not have the right to block or hit the ball when the ball is over the net when the game is stopped. Libero can substitute for the back of the player without notice to the referee and will not count as a replacement of the team. Libby can set the ball over the head like a set only when standing behind the offensive line. In addition, Libero is not eligible to serve. (Except in certain organizations, such as the NCAA, allow to serve). 1. Referee will risk the coin to find a team to choose between. Serves / Serves or selects a dice. 2. Servants must be served from the back of the field by not standing on the line and not following the line. Throw the ball and strike the ball through the net to the opponent's field within 8 seconds after the referee gives you the signal. 3. While being served by the rules But there are players standing in the wrong position at that time. Teams that stand in the wrong position will lose points. If a servant breaks the rules, even if they are in the wrong position at the moment, then the team that serves as the loser. 4 . Do not allow the team player to serve, block or hit the ball served. 6. When the ball crossed the net. Then the ball into the opponent immediately. A competitor who tries to get the ball off the field is called an Ace. 7. Team player To try to get the first ball without letting the ball fall in the ground. And connect the ball to the player called the set. To set the ball to the player to hit the ball to the opposite side to score. When the ball falls ground or mistakes. The score is considered to have ended. 8. Each player There are no more than 3 times before the ball to the opponent. Each player has no right to play two consecutive games, except for one player to the ball before the other. 9. Player of the rear and LibreOffice. No right to jump, hit the ball or block the ball. Except for the player after jumping from behind the 3 meter line to hit the ball. 10. Players are not allowed to use other players to send themselves to reach the ball. 11. Players are not allowed to play if the ball is still in the opponent's territory. 12. When the ball touches the ground or a mistake in playing. Those who do not make mistakes will get that score. And the team that scores points must serve in the next score. 13. When the serving team scores Those who serve in the next score must be players in the same position. I can change the player to serve. 14. When the serving team lose points. The other player will be given the next score. 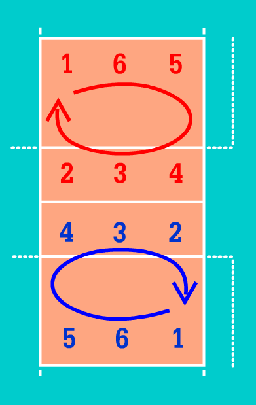 The second player must rotate to position 1 to serve and other positions must be rotated as well. 15. Change the Dan at the end of each set, set 5 or set the referee will change the team when the first team to score 8. Set a number to determine the winning team. It usually sets out to win 3 out of 5 sets, except in some custom ad hoc matches. Set 1 to set 4, any team to 25 points before winning the set. If the tie is 24-24, then the game is called Deuce, until either side scores more points than the other. Set 5, which sets the winner of the match, who made 15 points before winning the set. If the score is always 14-14, Deuce must play. Each party scored more than two points to finish the match. The field size is 18 meters wide and 9 meters wide. The area is 9 × 9 meters. Field colors must be light and the colors differ from the open space around the field. 1 meter wide lane over the center line. The top of the net is 7 cm wide. The top of the net is 2.43 meters (8 feet) high. The top women's lattice is 2.24 meters (7 feet 4 inches) from the ground. The field line is a white line around the field, 2 inches (5 cm) wide, consisting of the lateral line and the back line. It is the boundary line and part of the field. 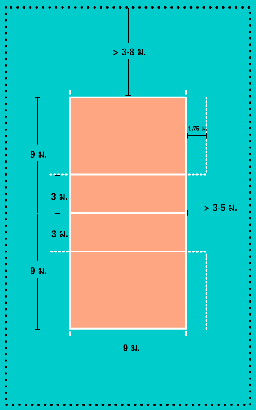 The 3-meter line is parallel to the net. The distance from the net 3 meters in both. This line will divide each side into the front and rear. The line defines the player's attack range. Limited Lines Coaches The dotted line drawn from the offensive line to the side length of 1.75 meters, then dragged perpendicular to the lateral line until the back line of the field. The antenna is attached to both sides of the net and is above the side of the pitch. The antenna is 1.8 meters in diameter and 10 mm in diameter. The antenna will extend upward from the top of the net to 80 cm to show the vertical line's assumption. The ball crosses the net correctly when the ball passes between the two antennas and does not touch the antenna. The temperature inside the field should not be less than 10 degrees Celsius. The global or official competition usually sets the temperature between 16 and 25 degrees Celsius. World class or official light is usually set at 1,000-1,500 lux, measured at ground level up to 1 meter. 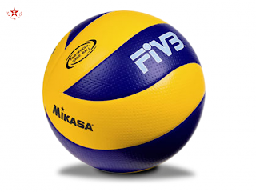 International Volleyball Federation Determine whether the ball must be spherical. Made of leather or synthetic leather with a circumference of 65-67 cm, weighing 260-280 g and a pressure of between 0.30-0.325 kg / cm.It may be one color or a complementary color if necessary.